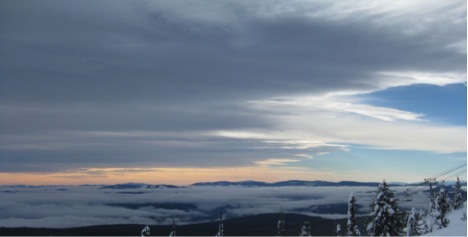 The influence of clouds is one of the big uncertainties for climate sensitivity. The big question for many people in climate science is what happens when we double the concentration of CO2 in our atmosphere? Is it good and plants grow more? Is it bad and we all die in the next mass extinction? Is it somewhere in between and maybe we’ll be ok? Most climate models estimate between 1.5oC and 4.5oC of warming for the doubling of CO2, but as I’ve blogged before there’s a huge difference between the consequences of 1.5oC and 4.5oC. So how do we narrow this down for a more accurate model? These scientists from Australia and France decided to measure the drying effect of cloud mixing to try and sort it out. Cloud feedbacks are one of the unknowns in climate models – they’re constantly changing, their impact is localised, but overall they have a big impact. They also have different impacts at different levels. High clouds, which are 8km above ground (or at 400hPa pressure) play a minor role in feedback, because at that level of the atmosphere, the temperature isn’t changing that much – it’s happening in the lower atmosphere because that’s where we’re spewing all our carbon pollution (incidentally, warming in the lower atmosphere and lack of warming in the upper atmosphere is one of the ways we know humans are causing current climate change). Mid level clouds (from 3km-8km) have medium levels of climate feedbacks, but the low clouds – below 3km (750hPa pressure) are capable of strong feedback. Because of this, these researchers decided to measure the low clouds. The evaporation that increases as the temperature warms could lead to more clouds forming, however on the other hand a warmer climate could mean more dry air is drawn to the surface which doesn’t allow the clouds to form. Which one is it? Firstly, cloud mixing. 2km above sea level there is a cloud boundary where a specific type of cloud mixing takes place. This is called ‘lower tropospheric mixing’ which sounds to me like a drink I’d order on a summer beach holiday. What it actually means is a mix of downdrafts of wind, local evaporation of rain and the transportation of shallow clouds. There is large scale mixing which happens via specific circulations, and there’s small scale mixing which is much more varied and localised. The researchers measured each type of mixing (small scale and large scale) separately to see whether they would dry out with increased temperatures or not. They measured the temperature and humidity change as well as drying between 700hPa and 850hPa pressure to work out the method of mixing involved. From the 48 different models they looked at – those that got warmer also got drier. For the small scale mixing, with 4oC of warming, the drying increased by 6-30% compared with only 8% on land. This means that while the land surface is experiencing smaller amounts of drying, clouds are drying out faster. So if you think the drought is bad – it’s worse for the poor clouds. For the large scale mixing, the researchers looked at monthly data from 10 different models and from applying temperature, humidity and drying to climate sensitivity were able to account for 50% of the variance in system cloud feedbacks! Considering they started their research project saying that ‘no compelling theory of low cloud amount has yet emerged’ I’d say that’s a very successful experiment. The bad news is they also found with large scale mixing that for every degree Celsius of warming, drying increased by 5-7%. They also found that moisture transport increases strongly with warming, but further research will be needed to work out why that happens (yay science! Discovering new things!). 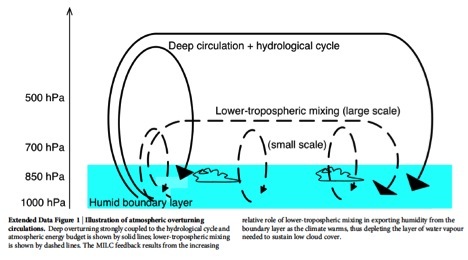 Lower tropospheric mixing dries out the boundary layer by 5-7% per degree of warming because of stronger vertical water vapour gradients, which lead to surface evaporation increases of 2% per degree of warming. While it’s good to know with more certainty the impacts of doubling CO2 in the atmosphere, unfortunately this time it’s not good news. The way to solve this problem? Stop burning carbon before we’ve doubled CO2. This entry was posted in atmosphere, climate change and tagged climate sensitivity, CO2 doubling by amyhuva. Bookmark the permalink.